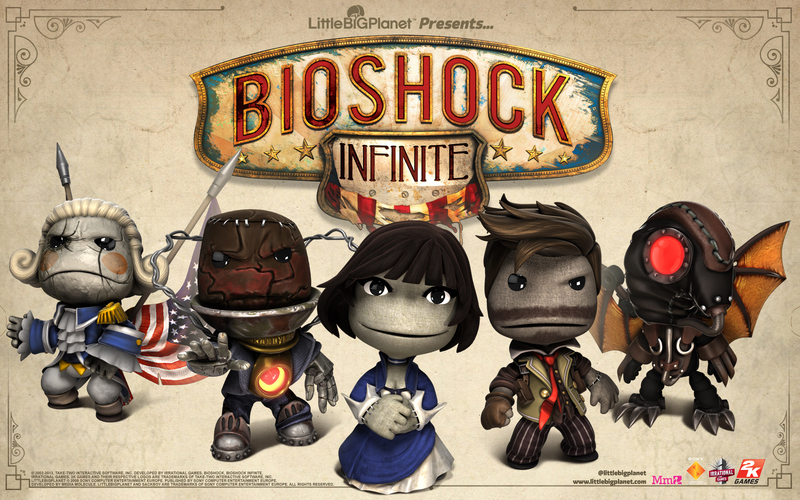 Media Molecule and Irrational Games have come together and added the Bioshock Infinite costume pack to LittleBigPlanet 2, LittleBigPlanet Vita and LittleBigPlanet Karting. Play as Booker DeWitt, Elizabeth, Motorized Patriot, Handyman and the Songbird as you traverse pre-constructed levels or build your own courses. The costumes are priced at $1.99 each, or $5.99 for the whole pack. On March 5, 2013, the Big Daddy and Little Sister were released in the Bioshock mini pack, which was originally a pre-order bonus for LittleBigPlanet Vita. With Media Molecule being big fans of the Bioshock franchise, they added bonus stickers to the release as well. If you are a huge fan of both the LittleBigPlanet and Bioshock franchises, then you should have no problem getting both of these Add-ons. The Bioshock Infinite costume pack will be available for purchase on March 27, 2013. Although I never bought any of the LittleBigPlanet games, they are still fun to play. You can build your own levels and share them with the community. From what I saw, building your own level in the game takes a lot of work and planning. The game can be very rewarding and frustrating at the same time. Below is a video for the LittleBigPlanet Bioshock Mini pack.